Localization of software, while not trivial, is not a particularly novel problem. Where it gets more interesting is in resource-constrained systems, where your ability to display strings is limited by display resolution and memory limitations may make it difficult to include multiple localized copies of any given string in a single binary. All of this is then on top of the usual (admittedly slight in well-designed systems) difficulty in selecting a language at runtime and maintaining reasonably readable code. This all comes to mind following discussion of providing translations of Doors CSE, a piece of software for the TI-84+ Color Silver Edition1 that falls squarely into the “embedded software” category. The simple approach (and the one taken in previous versions of Doors CS) to localizing it is just replacing the hard-coded strings and rebuilding. As something of a joke, it was proposed to make additional “joke” translations, for languages such as Klingon or pirate. I proposed a Hodor translation, along the lines of the Hodor UI patch2 for Android. After making that suggestion, I decided to exercise my skills a bit and actually make one. Since I don’t have access to the source code of Doors CSE, I had to modify the binary to rewrite the strings. Referring the to file format guide, we are aware that TI-8x applications are mostly Intel hex, with a short header. Additionally, I know that these applications are cryptographically signed which implies I will need to resign the application when I have made my changes. I installed the IntelHex module in a Python virtualenv to process the file into a format easier to modify, though I ended up not needing much capability from there. I simply used a hex editor to remove the header from the 8ck file (the first 0x4D bytes). Lines 1 and 7 here are the TI-specific page markers, indicating the beginning of pages 0 and 1, respectively. The lines following each of those contain 32 (20 hex) bytes of data starting at address 0x40000 (4000). I extracted the data from each page out to its own file with a text editor, minus the page delimiter. From there, I was able to use the hex2bin.py script provided with the IntelHex module to create two binary files, one for each page. With two binary files, I was ready to modify some strings. The calculator’s character set mostly coincides with ASCII, so I used the strings program packaged with GNU binutils to examine the strings in the image. With some knowledge of the strings in there, it was reasonably short work to find them with a hex editor (in this case I used HxD) and replace them with variants on the string “Hodor”. HxD helpfully highlights modified bytes in red. I also found that page 1 of the application contains no meaningful strings, so I ended up only needing to examine page 0. Some of the reported strings require care in modification, because they refer to system-invariant strings. For example, “OFFSCRPT” appears in there, which I know from experience is the magic name which may be given to an AppVar to make the calculator execute its contents when turned off. 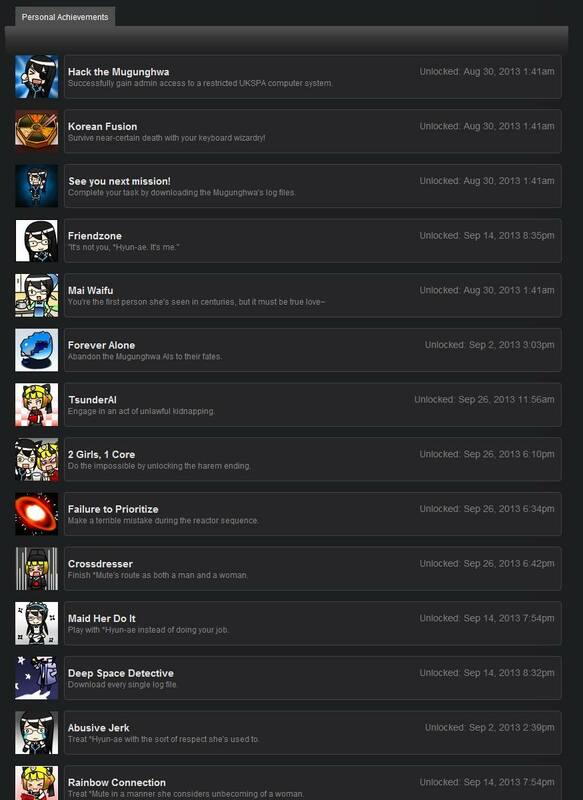 Thus I did not modify that string, in addition to a few others (names of authors, URLs, etc). I loaded the app up in an emulator to give it a quick test, and was met by complete nonsense, as intended. I’m providing the final modified 8ck here, for the amusement of my readers. I don’t suggest that anybody use it seriously, not for the least reason that I didn’t test it at all thoroughly to be sure I didn’t inadvertently break something. It’s relatively easy to extend this concept to the calculator’s OS as well (and in fact similar string replacements have been done before) with the OS signing keys in hand. I lack the inclination to do so, but surely somebody else would be able to do something fun with it using the process I outlined here. 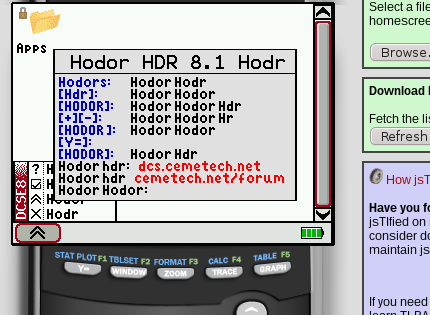 The programmer of that one took is surprisingly far, such that all of the code that feasibly can be is also Hodor-filled. This signature doesn’t identify the author, as you might assume. Once upon a time TI provided the ability for application authors to pay some amount of money to get a signing key associated with them personally, but that system never saw wide use. Nowadays everybody signs their applications with the public “freeware” keys, just because the calculator requires that all apps be signed and the public keys must be stored on the calculator (of which the freeware keys are preinstalled on all of them). I got some time to work on the divergence meter project more, now that the new board revision is in. 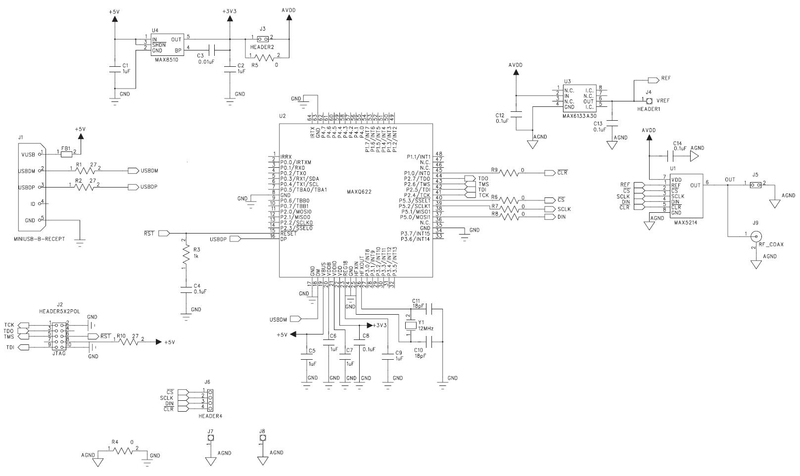 I assembled the boost converter portion of the circuit and plugged in a signal generator to see what sort of performance I can get out of it. The bad news: I was rather dumb in choosing a FET, so the one I have is fast, but can’t be driven fully on with my 3.3V MSP430. 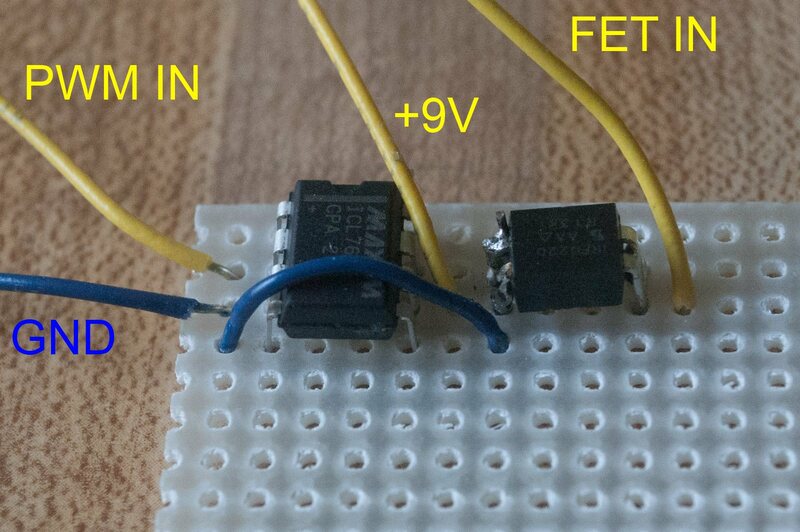 Good news is that with 5V PWM input to the FET, I was able to handily get 190V on the Nixie supply rail. Looking at possible FET replacements, I discovered that my choice of part, the IRFD220, appears to be the only MOSFET that Mouser sell that’s available in a 4-pin DIP package. Since it seems incredibly wasteful to create another board revision at this point, I went ahead with designing a daughterboard to plug in where the FET currently does. 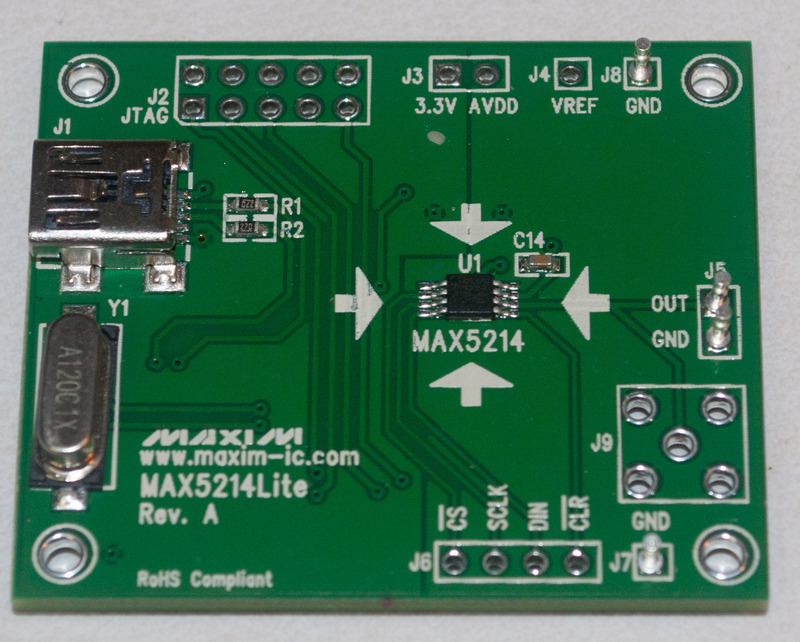 I got some ICL7667 FET driver samples from Maxim and have assembled this unit onto some perfboard, but have not yet tested it. Given I was driving the FET with a 9V square wave while testing, it’s possible that I blew out the timer output to the FET on my microcontroller while testing. Next time I get to work on this, I’ll be exercising that output to see if I blew it with high voltages, and connecting up the perfboard driver to try the high voltage supply all driven on-board. 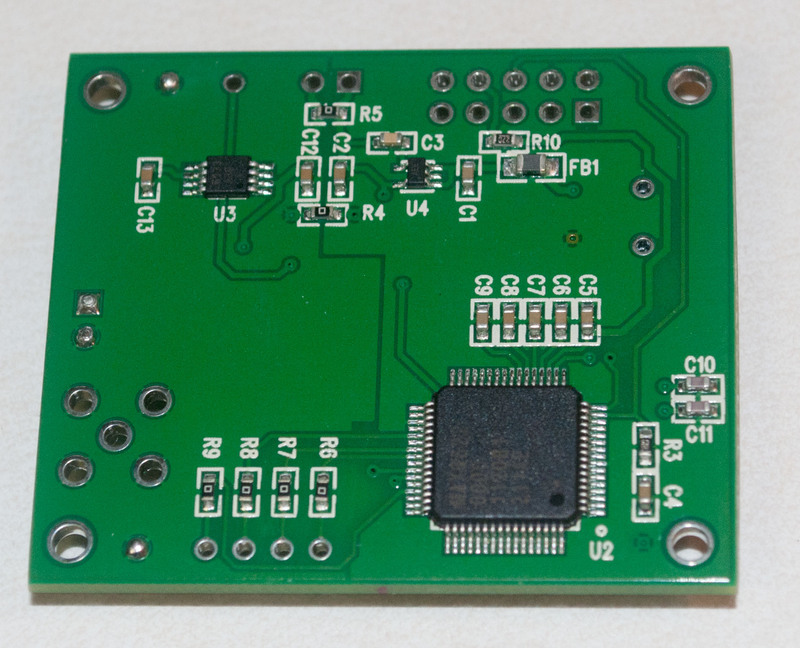 FET driver bodge assembled on perfboard. Connections are annotated. I recently pulled a few SDR (133 MHz) SO-DIMMs out of an old computer. They sat on my desk for a few days until I came up with a silly idea for something to do with them: rewrite the SPD information to make them only semi-functional- with incorrect timing information, the memory might work intermittently or not at all. Most reasonably modern memory modules have a small amount of onboard persistent memory to allow the host (eg your PC) to automatically configure it. This information is the Serial Presence Detect, or SPD, and it includes information on the type of memory, the timings it requires for correct operation, and some information about the manufacturer. (I’ve got a copy of the exact specification mirrored here: SPDSDRAM1.2a.) If I could rewrite the SPD on one of these DIMMs, I could find values that make it work intermittently or not at all, or even report a different size (by modifying the row and column address width parameters). 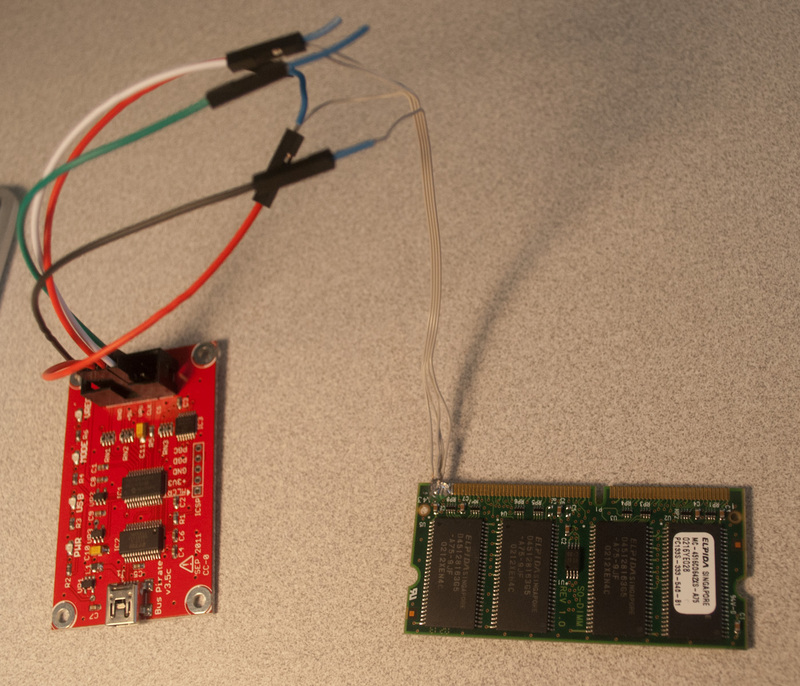 The SPD memory communicates with the host via SMBus, which is compatible with I2C for my purposes. The hardest part of this quest was simply connecting wires to the DIMM in order to communicate with the SPD ROM. 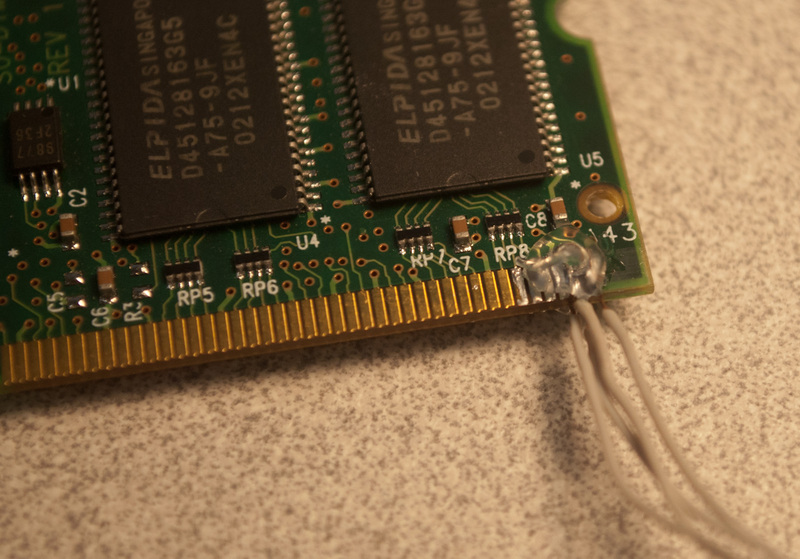 I gutted a PATA ribbon cable for its narrow-gauge wire and carefully soldered them onto the pads on the DIMM. Per information at pinouts.ru, I knew I needed four connections, given in the table to the right. 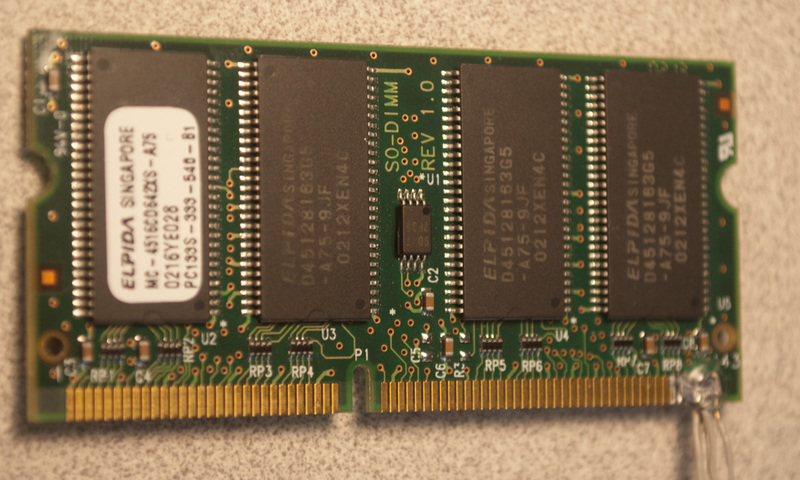 Note that the pads are labeled on this DIMM, with pad 1 on the left side, and 143 on the right (the label for 143 is visible in the above photo), so the visible side of the board in this photo contains all the odd-numbered pads. The opposite side of the board has the even-numbered ones, 2-144. With the tight-pitch soldering done, I put a few globs of hot glue on to keep the wires from coming off again. 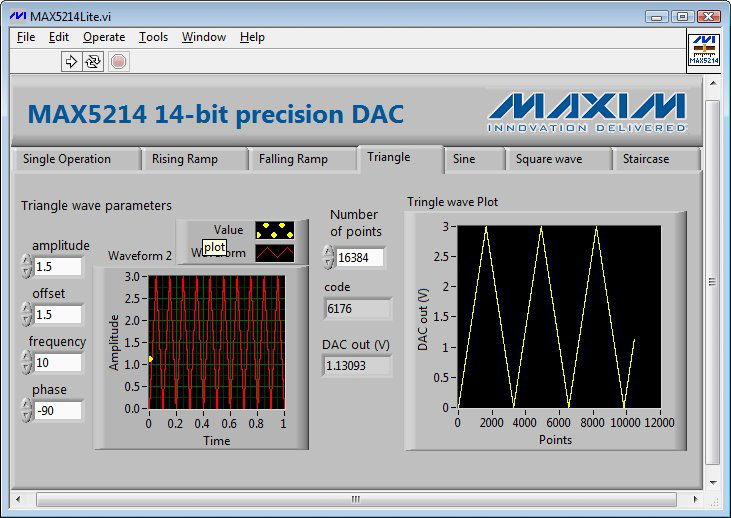 Searching 7bit I2C address space. The bus scan returns two devices, with addresses 0x30 (write-only) and 0x50 (read-write). The presence of a device with address 0x50 is expected, as SPD memories (per the specification) are always assigned addresses in the range 0x50-0x57. The low three bits of the address are set by the AS0, AS1 and AS2 connections on the DIMM, with the intention that the host assign different values to these lines for each DIMM slot it has. Since I left those unconnected, it is reasonable that they are all low, yielding an address of 0x50. I write 0 to address 0xA0 to set the memory’s address pointer, and read out the first three bytes. The values (0x80 0x08 0x04) agree with what I expect, indicating the memory has 128 bytes written, is 256 bytes in total, and is type 4 (SDRAM). In the above block, I attempted to write zero to the first byte in memory, which was NACKed. Since that failed, I tried the same commands on address 0x30, with the same effect. With that, I admitted failure on the original goal of rewriting the SPD. A possible further attempt to at least program unusual values to a DIMM could involve replacing the EEPROM with a new one which I know is programmable. Suitable devices are plentiful- one possible part is Atmel’s AT24C02C, which is available in several packages (PDIP being most useful for silly hacks like this project, simply because it’s easy to work with), and costs only 30 cents per unit in small quantities.